With 2.3 million Australians living with asthma, and one in three with allergies, creating an allergy-smart home is a growing consideration. Everyday triggers including pollutants, mould, volatile organic compounds and dust mite allergens can set off symptoms. Australians spend about 90% of their time indoors, so the quality of the air that we breathe inside is of major importance. Pollutants in indoor air typically occur more frequently and at higher concentrations than outside air, and today’s homes tend to be more airtight and built with materials that can contribute to indoor air pollution. Condensation as a result of inadequate ventilation can also lead to a very dangerous consequence: mould. Not only is mould unattractive and annoying, but it poses serious health risks. Effective ventilation in the home is essential to keeping condensation and mould at bay. This combination of factors can be very harmful; however, through careful selection of allergy-smart building materials and products, you can ensure a healthy home is created for you and your family. Mould is one of the most common triggers for asthma and allergies. A recent study commissioned by CSR Gyprock found that 35% of Australian households surveyed have experienced mould, with the bathroom being the most affected room in the house, followed by the bedroom. With this in mind, CSR Gyprock created Gyprock Sensitive; a 10mm plasterboard offering enhanced mould and moisture resistance. Increased steam and humidity provides perfect conditions for mould and mildew growth, making Gyprock Sensitive an ideal solution for wet areas such as the bathroom and laundry. “Gyprock Sensitive Plasterboard is mould resistant due to a powerful but gentle antifungal agent throughout its core, which penetrates the paper and subsequent decorative coating,” CSR Gyprock marketing communications and brand manager Alisha Mykytowycz says. Gyprock Sensitive is the first and only residential plasterboard to be approved by the National Asthma Council Australia’s Sensitive Choice program as a better choice for those living with asthma and allergies. When designing or renovating a bathroom, one of the most important things you should be thinking about is ventilation. Poor quality air circulation can lead to all sorts of issues, from mould growth, to trip hazards due to slippery surfaces caused by a build-up of moisture. “The key to keeping your bathroom safe and bacteria-free is to allow the air to circulate around the room easily,” IXL marketing manager Malcolm Russell says. For this purpose, IXL has created a multi-functional bathroom heat, vent and light unit that is the perfect choice to create a well ventilated and healthy bathroom. The IXL Tastic Neo collection is a comprehensive and contemporary range of three-in-one solutions, designed to suit any style of bathroom but most effective in small to medium sized rooms. For those wanting a combination of heat, vent and light, the premium Tastic Neo Single or Dual is ideal for all styles of bathrooms from contemporary to classic or country to coastal. Individual heat, vent or vent and light solutions are also available. The Vent Module can be positioned over the shower, or in the laundry to banish odours and water vapour effectively, and the Vent n Lite Module makes it easy to position ventilation and task lighting wherever you need it. Effective ventilation can reduce humidity that leads to dampness and mould growth and in turn, prevent or relieve the symptoms associated with asthma and allergies. Louvre windows from Stegbar enable you to control the strength of the breeze allowed through. When opened, louvres act as air conditioning and when closed, they seal tightly to keep water and wind out. “Louvres are fast becoming a popular trend in home design,” Stegbar director of marketing Christine Evans says. Bi-fold windows and doors are another great option for increasing ventilation within your home. When opened and folded away, they create an open space, seamlessly bringing the outdoors in and providing adequate ventilation. Ideal for both traditional and contemporary homes, Double Hung windows can allow you to direct air through the top, bottom, or both sashes together. The windows open at both ends with one easy motion to provide the ultimate ventilation control. 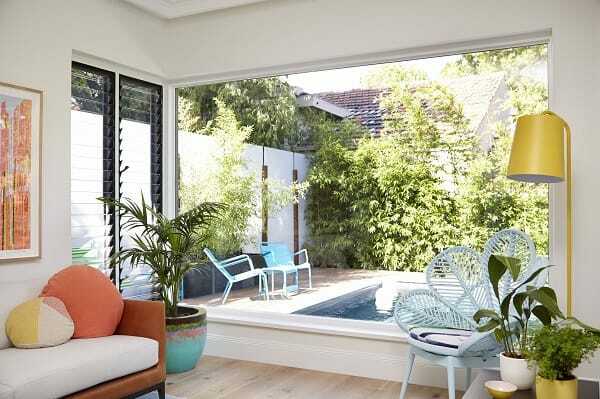 Stegbar Windows and Doors have also been tested and comply with the Green Building Council of Australia’s guidelines on Indoor Environment Quality. Considering the large amount of time that Australian’s spend indoors, the quality of air can have a significant impact on the health, wellbeing and satisfaction of a home’s occupants, particularly for those living with asthma and allergies. With an educated collection of the right products and materials, it is possible to create an allergy-friendly environment that banishes harmful triggers and reducing the symptoms associated with asthma and allergies.